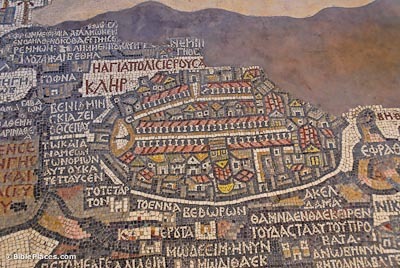 A 6th century church floor in Medeba, Jordan has a mosaic map of the land of Israel with numerous place names in Greek. 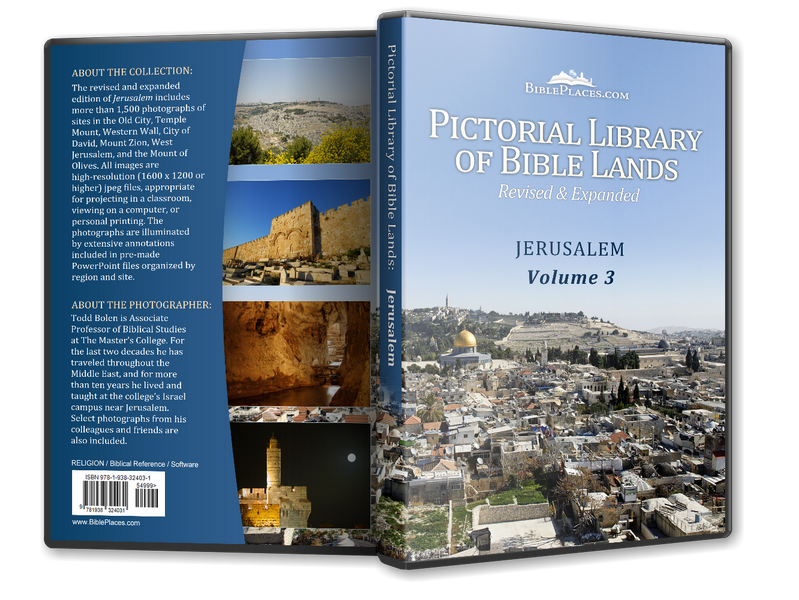 The center of the map is an open-faced depiction of Jerusalem with the city walls, gates, churches (with red roofs), and the Cardo. This main street of the city is depicted with two rows of colonnades running the length of the city from north to south. 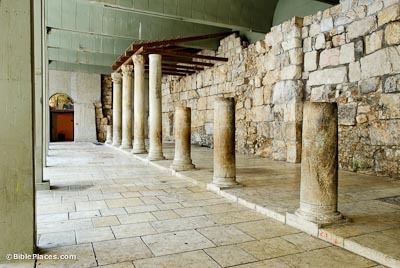 Uncovered by Nahman Avigad’s team in the 1970s, the Cardo in the Jewish Quarter was excavated for about 200 meters. 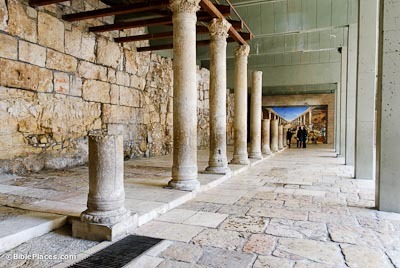 This portion dates to the time of Emperor Justinian in the first half of the 6th c. A.D. An earlier portion of the Cardo was constructed in the Roman period beginning at the modern Damascus Gate in the north, but it didn’t stretch this far south until centuries later. 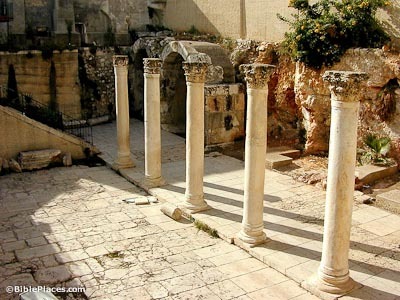 The central street of the Cardo is 40 feet (12 m) wide and is lined on both sides with columns. The total width of the street and shopping areas on either side is 70 feet (22 m), the equivalent of a 4-lane highway today. 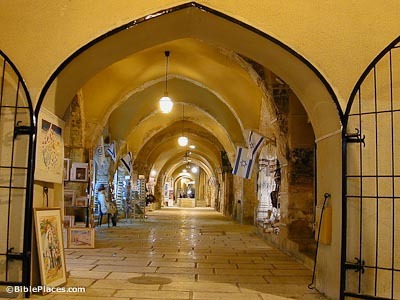 This street was the main thoroughfare of Byzantine Jerusalem and served both residents and pilgrims. Large churches flanked the Cardo in several places. The columns supported a wooden (no longer preserved) roof that covered the shopping area and protected the patrons from the sun and rain. Today the Byzantine street is about 6 meters below the present street level, indicating the level of accumulation in the last 1400 years. A portion of the Cardo has been rebuilt as a modern shopping lane. Jewish storekeepers sell fancy souvenirs and keepsakes to tourists “for a good price.” This street continues north to Damascus Gate; as it leaves the Jewish Quarter it becomes the division between the Christian and Muslim Quarters. As in ancient times, this street is still the main one in the Old City, but today it is much narrower than it once was.